Eating Lunch At School – Last Friday I ate lunch with Sidney at the school she teaches at. I have visited her for lunch before but this time was unique. Instead of just hanging out or bringing Subway with me, I ate the actual hot lunch. On the menu was pizza and it looked like it had not changed one bit since I was last in elementary school some 17 years ago. But I would say the taste had improved. 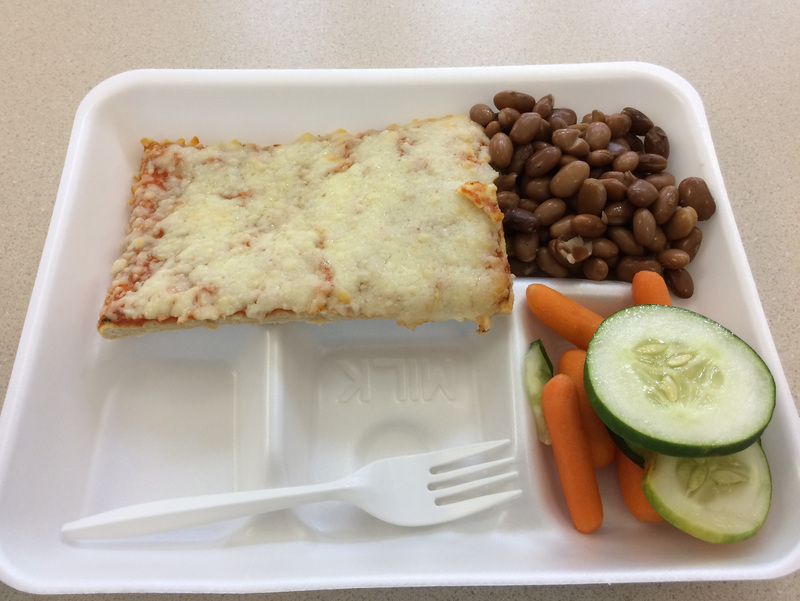 I enjoyed eating my pizza, pinto beans, veggies, and low fat Cheetos while meeting Mrs. Reser’s class. This was my lunch at Sidney’s school. 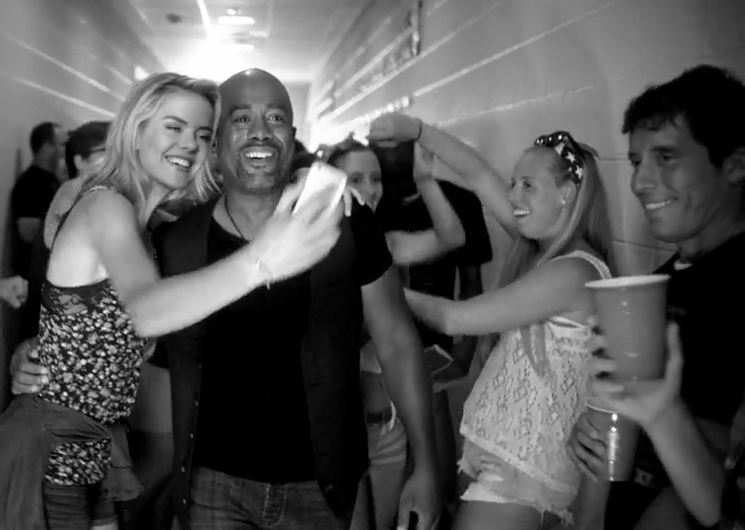 That One Time I Was in a Music Video – Two years ago, Darius Rucker released his music video for “Homegrown Honey.” At the time, I knew I had a shot at making an appearance in it just because I had participated in the filming. However, my better judgment told me that I probably wouldn’t make the cut. Much to my pleasure, I did in fact make a “cameo” in the video. Although for only a second or two, I am clearly visible at the 1:42 mark. I made the cut in Darius Rucker’s “Homegrown Honey” video. Weekend Plans – This weekend I will be heading over to Clemson with Sidney and her family. We are making the trip to Death Valley to watch the college football blockbuster of the week as the #5 Tigers host the #3 Louisville Cardinals. Another reason for the trip is the chance for me to see my friend, Kenny. He is traveling all the way from Seattle to watch the game and cheer on his uncle who happens to be the head football coach at Louisville. It won’t be the first time I meet Kenny in Clemson. Two years ago we met up for the same matchup. The Tigers defeated the Cardinals that day so I am sure Kenny (and Coach Petrino) will have revenge on their minds. 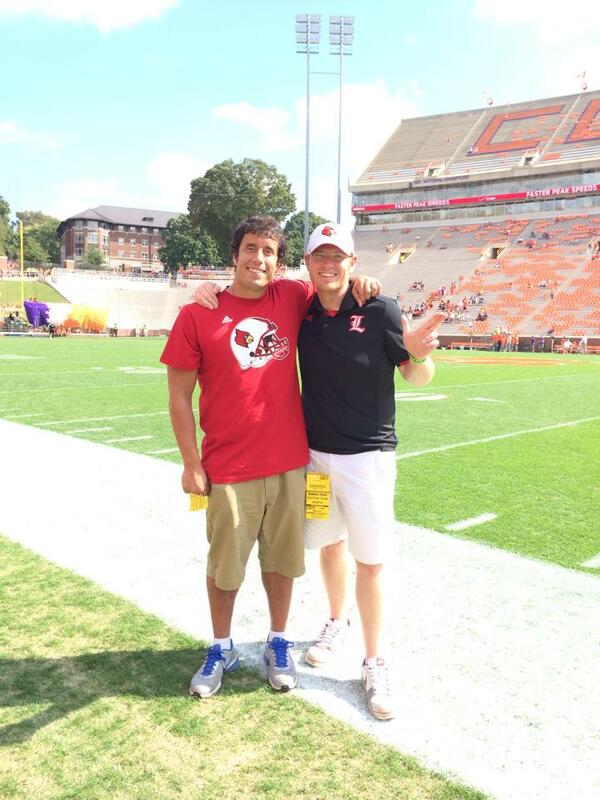 Kenny and I on the sidelines in Clemson’s Memorial Stadium in October of 2014. Debate Reaction – I must say that Monday’s debate was every bit as advertised. I sat on the couch for 90 minutes and happily watched as Hillary Clinton and Donald Trump battled it out. It is tough for me to judge a winner but I was surprised that Trump didn’t act more restrained. I know he got to this point by being outrageous but I thought he would have tried to tone it down just a little bit in hopes of persuading undecided voters (like myself). I can’t wait for the next one! From the Archives – Three years ago I followed through on one of my many dumb blog ideas. During a weekend in Spokane with my family, I visited three different froyo places and gorged myself on ice cream. 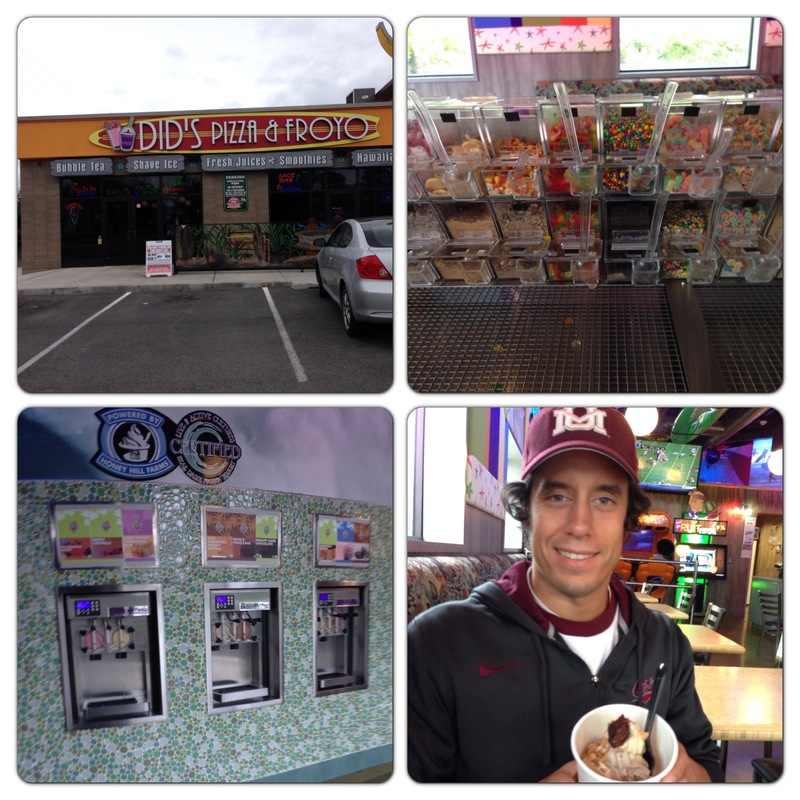 I then reviewed each location for factors such as taste, toppings, cleanliness, etc. If you are a froyo fan, you should really read my post. I visited three different froyo places in a weekend in September of 2013. This was one of them. As always, thanks for your support of this blog. Enjoy your weekend and I look forward to touching base again on Sunday. Don’t Blink. Tonight is the blog post where I ask my readers for honest, decent advice. Each day I have a certain item at lunch. No, no, no I am not talking about my peanut butter sandwich. The second most important item in my lunch is my daily banana. When I went on a diet for my wedding I started eating them each day as a compliment to my peanut butter sandwich. 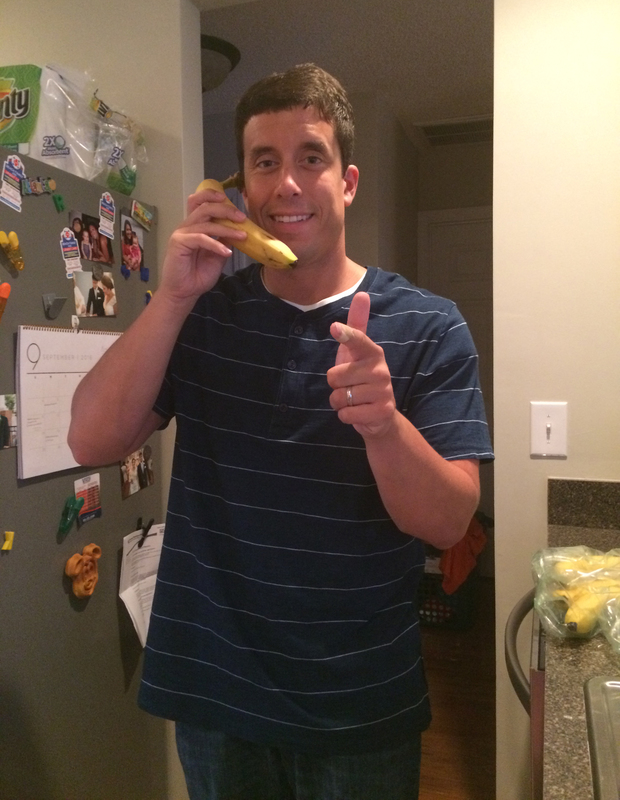 Although the big day has passed and about a third of the weight lost has returned, I am still eating a banana at noon every Monday-Friday. I always eat a banana with my lunch. 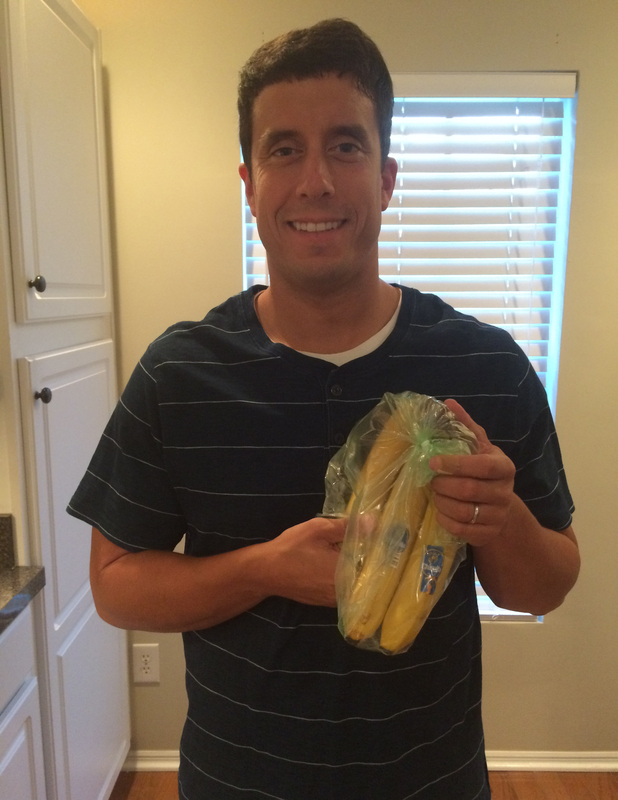 Although I love bananas, I had two big dilemmas when it came to caring for them. Luckily, one was recently solved. I had no idea the brief amount of time it took for bananas to become too ripe. I quickly learned that even if I bought green bananas on Sunday they would be more black than yellow on Friday. Thanks to my mother-in-law, she gave me a special plastic bag that is supposed to keep my bananas in good shape, or, as she said, “Looking pretty.” Not only will it keep my daily fruit from losing its optimal taste, it will also allow our fruit bowl to look more presentable for a longer period of time. My mother-in-law gave me this bag to put my bananas in. My second problem is yet to be solved. I transport my lunch in my gym bag. In the morning I throw my banana in the bag, drive to campus, get my workout in, and go to the office. When I arrive at my desk, I take out the banana and put it on my desk to protect it. However, by then, my banana is often bruised or lightly smashed. This takes a lot of the joy away from eating it at lunch as I have to throw the damaged portion (s) away. Please note that when I am carrying around my gym bag I am mindful of the delicate fruit inside so it is not like I am acting careless. Can you give me advice for securing my banana? Give me your best Pinterest-inspired tips and tricks. Whatever you tell me, please just make sure it will still allow for me to carry it in my gym bag (this would be way too easy if you just told me to carry it in my hand). I appreciate your consideration in this matter. Don’t Blink. 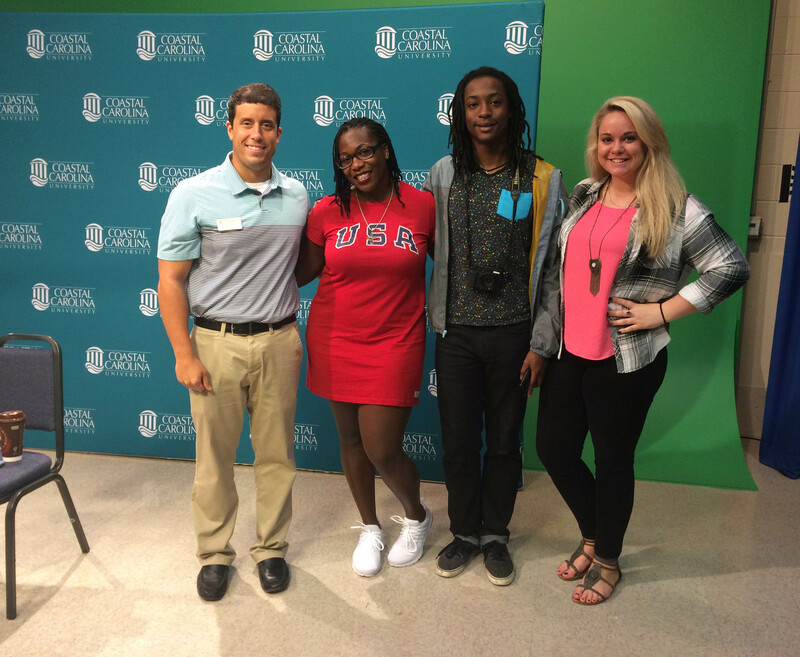 Today at Coastal Carolina University we kicked off a social media event called #CCU Facebook Live Week. It all started this morning when our social media team interviewed a three-time Olympian. The event will continue throughout the week as we interview a different person on each of the next four days. 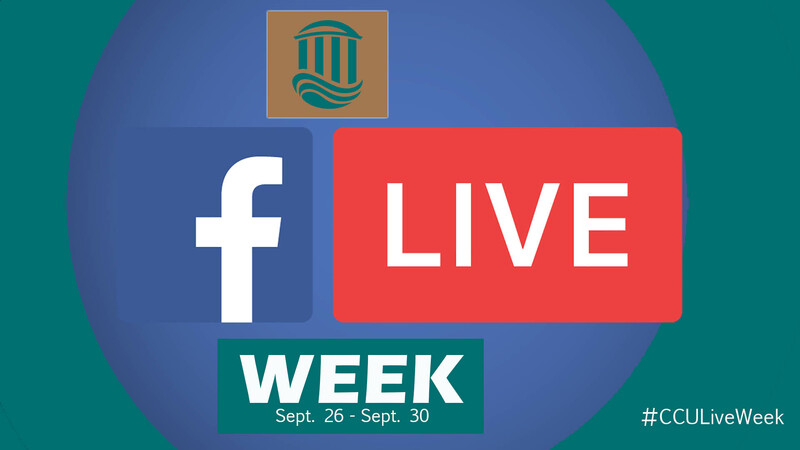 This week is our #CCU Facebook Live Week (graphic is from Facebook page and is accessible to all). 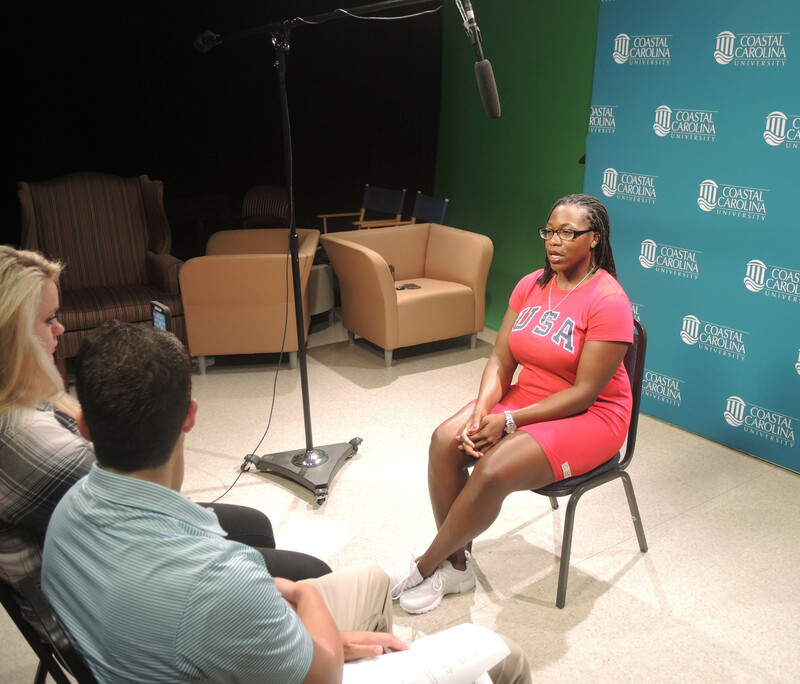 Leading off our #CCU Facebook Live Week was track and field superstar Amber Campbell. This past month she finished sixth in the hammer throw at the 2016 Summer Olympics, the highest finish ever for an American woman in the event. But Rio wasn’t her first rodeo. Amber also competed at the Beijing (2008) and London (2012) games. She has a laundry list of other accomplishments at the national and world level as well. As you might guess, Amber Campbell is a Coastal Carolina University alumna. Our #TEALnation community is extremely proud of her so it made sense to ask if she would want to participate in our #CCU Facebook Live Week. Despite a hectic schedule, Amber graciously accepted our invite and traveled down to our studio for today’s interview. She brought a lot of energy and a glowing smile to campus. Our social media team with three-time Olympian Amber Campbell today (from l-r: Me, Amber Campbell, Eddie, Lauren). The interview went well as I had my two hardworking interns, Eddie and Lauren, helping out. Our assistant director of Media Services, David, filmed the interview with equipment just a tad bit nicer than my iPhone. We all enjoyed the opportunity to be around Amber and share her thoughts/insight with our large #CCUSocialMedia audience. A little behind the scenes action for you. I asked the questions and Lauren filmed the interview. Eddie covered the interview on Snapchat and Instagram Stories. David was behind us all. I hope you drop in on one of our Facebook Live broadcasts this week. Thanks so much to Amber Campbell for starting us off in grand fashion. Don’t Blink. Next weekend I will travel to watch the biggest college football game of the year thus far when Clemson hosts Louisville. The battle of unbeatens will take place in front of a nationally televised audience at 8 p.m. on ABC. Both teams will be vying to stay eligible for the College Football Playoff. A lot will be on the line. However, the football game next Saturday has nothing on the competition that will take place tomorrow night. Up for grabs will be much more than a spot in the coveted “final four” of college football. You think Louisville’s star quarterback Lamar Jackson is going to feel pressure? Take a moment to realize what must be going through the minds of the two people who will take the stage at Hofstra University on Monday night. Four years ago I wrote a long blog post about why I love the presidential debates. Not only is that passion still inside of me, it is magnified more than ever. Is that a surprise, though? Never before has a presidential debate been more anticipated, analyzed, and unpredictable. Coming from a major sports fan, I concede that the script for tomorrow night’s debate is perhaps greater than any Super Bowl or Game 7. In the wildest presidential race our country has seen, the two candidates will finally come face to face tomorrow evening. The storylines are endless, I could go on and on. But instead of throwing out a random assortment of ways the media has framed the debate, let me just be simple about what Monday evening will finally bring: Hillary Clinton vs. Donald Trump. I couldn’t be more excited. Competition simply doesn’t get any better than this. The stakes don’t get higher. The scrutiny doesn’t get more intense. In short, the drama tomorrow will be through the roof. I am giddy to see how Clinton and Trump perform. I am interested to find out how the debate is moderated. I am intrigued to learn how the American people will respond. It just doesn’t get any bigger. Preparation, dreams, and reputations will be put on the line tomorrow night…for millions of people to see. Talk about pressure. For an undecided voter, this first debate will be extremely suspenseful for me. I have never followed a presidential race as closely as this one. I followed the primaries, attended the rallies, and watched the conventions. I am dialed in on the main issues and the platforms of the candidates. I am now ready to watch them battle it out in front of each other. 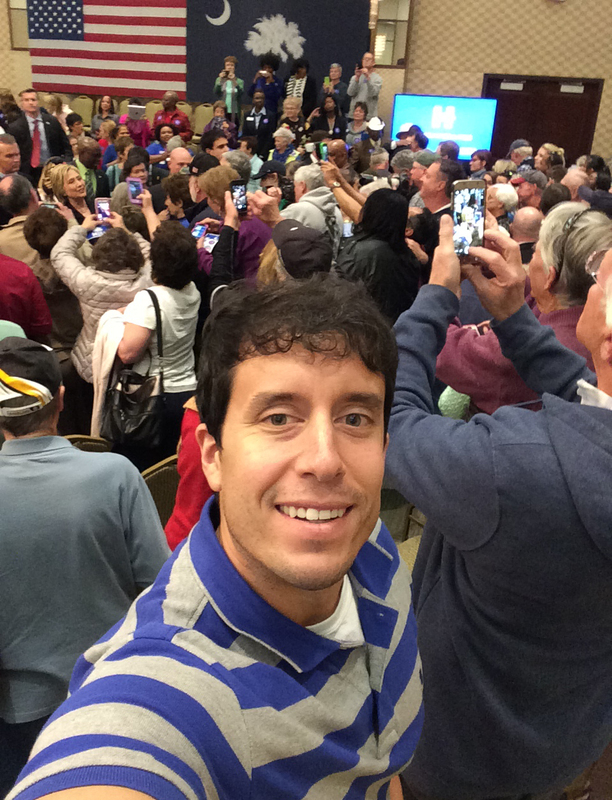 I attended a Hillary Clinton rally as well as a couple rallies for Republican presidential candidates. As an undecided voter, I am invested in this race. Bring on tomorrow night’s competition! In another example of why this country is so amazing, we will get to watch the two frontrunners for the highest office in the United States express their views while critiquing those of their opponent. Sleep well tonight, Clinton and Trump, a big day awaits both of you tomorrow. Don’t Blink. Tweeted at by Dateline – As I mentioned before, I watch news magazines like crazy. When you like them as much as I do, you have a dilemma come Friday night. When 10 p.m. rolls around, do you watch 20/20 or Dateline? This past week I tweeted out the decision I ultimately made. It didn’t take long for a reply from the main Twitter account of the program I didn’t choose. 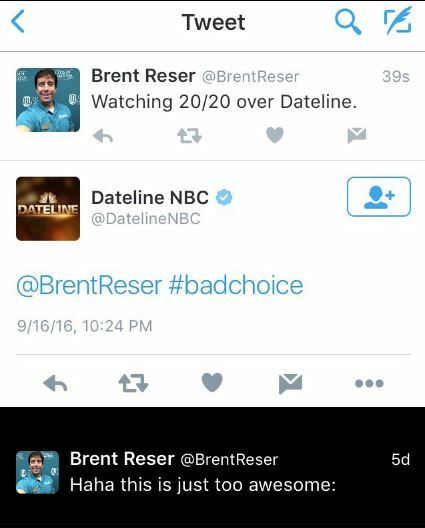 Although the blunt assessment of my choice was a little cold, I still found it pretty awesome that Dateline tweeted at me. Not even a minute had passed before Dateline responded to my tweet. Gas Going Up – One of the major stories in South Carolina right now is rising gas prices. Because of a major pipeline leak in Alabama, our state has responded by raising prices. Ironically, the person who alerted me to the crisis was on the other side of the country. Pete, a good friend of mine from my Missoula days, texted me about the problem Friday morning. After work I filled up hassle free for $1.79 per gallon. I beat the mad rush to the pump that occurred over the weekend and of course the new $2.05 per gallon price. 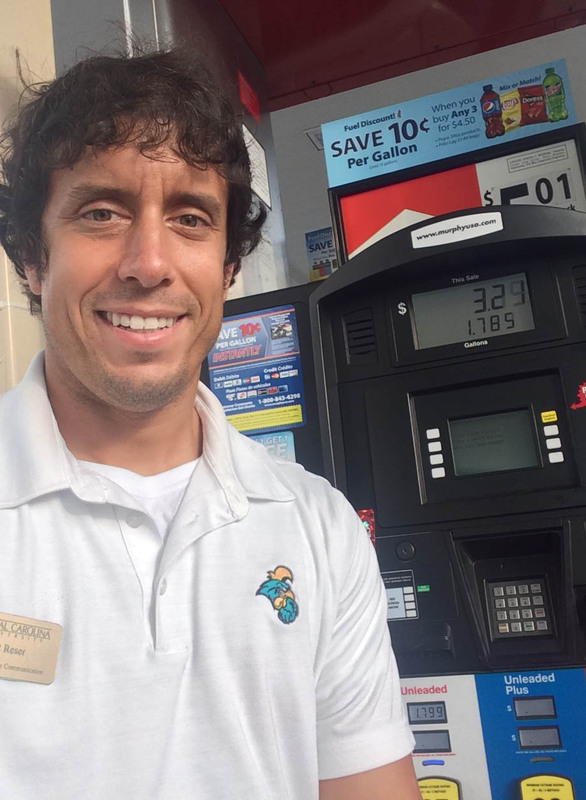 Last week, gas was at &1.79 in Myrtle Beach. I filled up before it went up. Too True – Okay, okay I apologize for sharing comics in consecutive weeks but this was too good to pass up, especially for a blogger. The below strip comes from a comic called Crankshaft. As my brother, sister, and wife all routinely give me a hard time for blogging about “nothing,” I felt they would get a kick out of this. This Crankshaft comic strip had me thinking about what my brother says about my blog. Big Brother 18 Finale Reaction – I can’t put into words how disappointed I was about last night’s Big Brother 18 finale. For those who don’t watch the show, you just need to know this: The person who should have won did not. Just the fact alone that the vote was close provided enough of an insult but for Nicole to actually WIN over Paul was asinine. When you looked at Paul’s body of work throughout the show compared to that of Nicole’s it appeared as if there was no debate on who should win. It seemed so cut and dry. I didn’t like Paul from the start of the show but I wanted to see the person I thought deserved to win bring home the $500,000. I literally stormed out of the room last night when the deciding vote was cast. From The Archives – I have a couple past blog posts written on September 22 to share with you. Two years ago I told the world about my top five favorite fast food restaurants. As I sit here presently, I can tell you that my list has since changed! The changes include both the order and a couple of the restaurants included. An updated list will come in the future. Three years ago on September 22 I wrote about the life, death, and legacy of our family cat, Nabisco. We had her for 16 years and she brought my family so much joy. 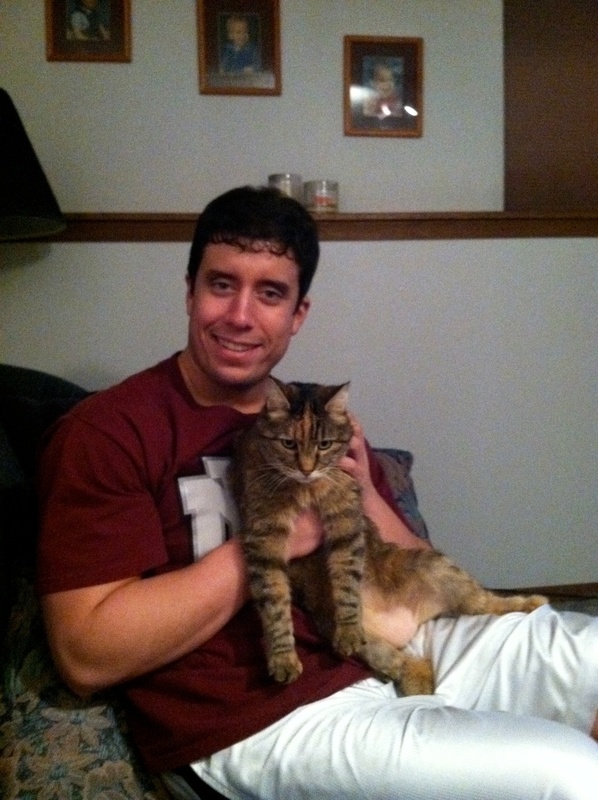 Nabisco and I…the best cat I have ever known. Sorry to end the Thursday Rundown on a somber note. However, snap out of it by realizing football is on tonight! While you might opt for the NFL game, I will be watching Clemson vs. Georgia Tech. Have a great weekend. Don’t Blink. For years I thought about doing something pretty silly. Scratch that, I had done more than just think about it, I had talked aloud about it on numerous occasions. However, up until today I never had the guts to do it. Now it is too late because two people beat me to it. Perhaps not surprising, they are both journalists. Back in my college days I remember sitting with my friends discussing a certain topic in our all-you-can-eat dining hall (it was called the Food Zoo…I am not kidding). Thinking we had come up with a crazy, rebellious idea we continuously pitched this idea to one another: What if we stayed in the Food Zoo ALL DAY LONG? 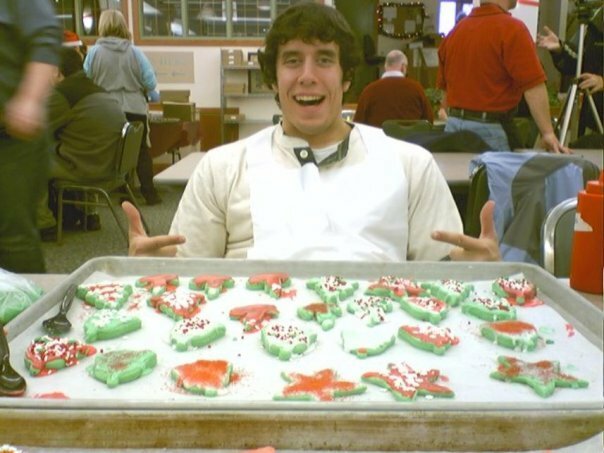 This is me inside the Food Zoo at the University of Montana in 2007. On this day they had a holiday cookie decorating event for the community (which explains why you might see some older people in the background). Oh man, what a groundbreaking, newspaper worthy moment that would be. How would we not earn instant glorification from campus if we wasted a whole Saturday in the cafeteria acting annoying and filling up plate after plate of food? This lofty goal inspired me in other environments too. Also in college my friends and I went to this $5 all-you-can-eat pizza dump quite frequently. We plotted doing a day-long stakeout there as well. But I would later develop higher aspirations. As a way to make good on my college scheme, I considered spending several hours at a Golden Corral. Not only would the food be of a higher quality but it would make a good blog post. Too late now. Two journalists from the Business Insider, Hollis Johnson and Kate Taylor, went to their local Red Lobster and stayed for eight hours. They did this to cash in on the restaurant’s Endless Shrimp promotion. In a long but entertaining summary of their experience, the two wrote about what it was like to spend the day in one of America’s most popular casual dining chain restaurants. Although I am a little bitter at the fact they stole my idea, I can’t help but admit that they did a lot more than what I would have done. You see, Hollis (he is a male) and Kate didn’t just loiter around Red Lobster for eight hours while picking at shrimp every now and then. Rather, they went completely all-in. Between the two of them, the duo consumed 305 shrimp. This is Kate Taylor and Hollis Johnson at the Red Lobster they spent eight hours at. They consumed 305 shrimp (photo is courtesy of Business Insider). Hollis and Kate actually called the Red Lobster beforehand and let management know about their plans. They didn’t catch anyone off guard. The restaurant knew they would have some guests sticking around all day and they knew to prepare extra shrimp. So yes, that reality does take a little bit of the luster away from their story. So does that leave the door open to me? Should I wear a hidden camera and walk inside a restaurant unannounced and sit down for eight hours while eating an exorbinant amount of food? Nah, I don’t think so. I like to reason that I have matured just a little bit since my college days. And while I will do just about anything for this blog, I don’t think I will go that far (even if I did do this). Well done to Hollis and Kate for executing a pretty brilliant story idea. Don’t Blink. I normally don’t wear accessories. Necklaces, earrings, and grills just aren’t my thing. Shoot, I don’t wear hats all that much either. But when Sidney and I married in June a piece of jewelry was automatically added to my daily dress. 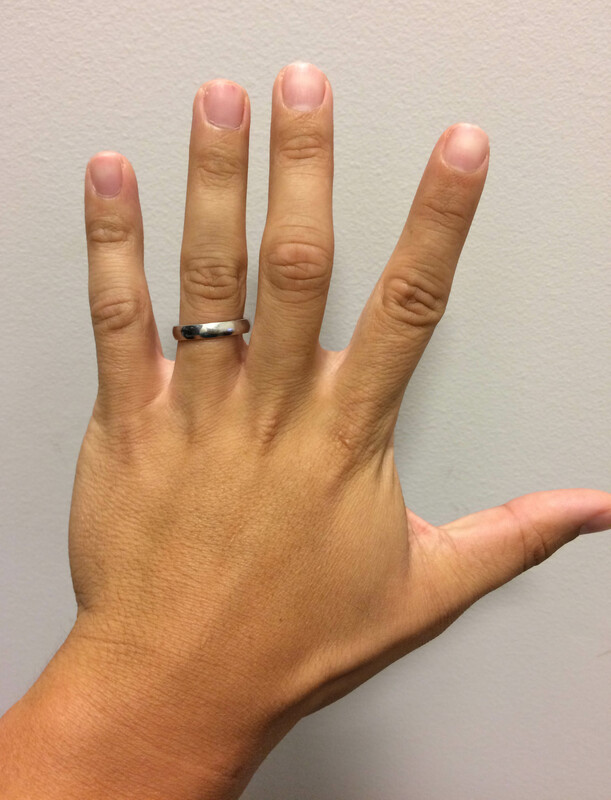 For over three months I have proudly worn a wedding ring. Until we said “I do” I had never worn a ring for longer than a day in my life. To go from never wearing something to wearing something almost 24/7 is an adjustment. However, that transition period was much shorter than what I thought it would be. Although a little strange at first, it really was just a matter of days before I got used to the shiny ring Sidney bought me. By the end of the first week it truly felt like a piece of me. Today marks the 102nd day I have worn my ring but because the ring feels so familiar it kind of feels like the 10,200th day I have worn it. I have now worn my ring for over 100 days and it feels completely natural. However, just because the ring feels comfortable and natural doesn’t mean I haven’t established some habits with it. For starters, I take it off two times each day: when I work out and when I shower. Having the ring get caught on a weight or a machine is not comfortable. Also, perspiration causes my ring to slip off my finger. Thus, you can probably guess why I take it off when I shower. Water seems to encourage my ring to slide right off so I always remove it before exercising or bathing. With the exception for those two instances, I keep my ring on. I eat my meals with it on. I sleep with it on. I do all my work with it on. Sidney and I do ring checks on each other quite often and I think I am 100% for having it on when she performs her inspection. Fr. 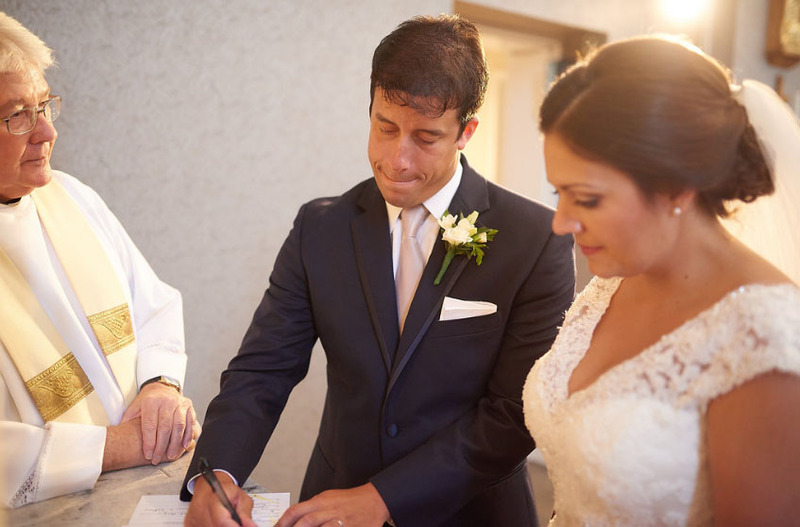 James LeBlanc, pastor of St. Andrew Parish in Myrtle Beach, looks on as we sign our marriage certificate. I had worn my ring for about 30 minutes up until this point. (photo courtesy of Nicholas Gore Weddings Photography). One thing I do find myself doing is tugging at my ring when I am thinking or watching TV. Using the thumb and middle finger of my right hand I will pull it up about halfway on my ring finger and then drop it back down into its proper spot. I can do this over and over at a frequent pace. But besides my habits of taking my ring off, wearing it, and tugging at it, there is one thing that causes me to think about my marriage symbol a lot. Unfortunately, that “thing” is the fear of losing it. Always in the back of my mind I fight off the possibility of misplacing my ring. Even when I take it off to shower I will step out and dry off only to freak out for a split second because I forgot that I purposely removed it. I continually question myself about how I am going to make it through the rest of my life without ever losing it. The normalness of wearing the ring set in quickly, the paranoia of losing it did not. I hope as time goes on my fear will subside. I love wearing my ring. I love how it looks. I even love showing it off! Most of all, I love that an amazing woman bought it for me to symbolize something very special. Don’t Blink. Every now and then I flip the page on my Life’s Little Instructions calendar and I come across a piece of advice that is worth blogging about. I couldn’t help but mention today’s entry. I have learned this all too well over the years. Sometimes in life it takes a while to learn a lesson. It might take a quarter century or so to really understand how the world works. I read today’s Life’s Little Instructions piece of wisdom and a sarcastic smile spread across my face. Call me gullible but I used to think a free check up, a complimentary inspection, or a courtesy evaluation was a gesture of goodwill from a business or professional. I thought a company would actually be objective during the “free” inspection and let you know honestly whether work/action needed to be done/taken. Even as someone who is in marketing and should see right through something like this, it wasn’t until a couple years ago that I really understood that these types of offers are really gimmicks. To people who are slow like me, please heed this advice: If you take your car in for a free inspection, if you have your blog evaluated for SEO optimization (I get offers daily), or if you have an appliance looked at in your house, the person doing the “consultation” will find “problems.” It never fails. For almost ten years I would automatically act on the advice and go along with whatever was recommended. However, after realizing I was getting burned, I learned that the concept of a second opinion wasn’t just reserved for medical professionals. Don’t get me wrong, I am not bitter toward people in industries who offer free inspections/evaluations. It is a great way to get new customers into the shop. Also, for the most part, it is completely honest. Although most of the time the evaluator will find problems, you never have to authorize the business to act on them. Furthermore, I don’t want to generalize too much. 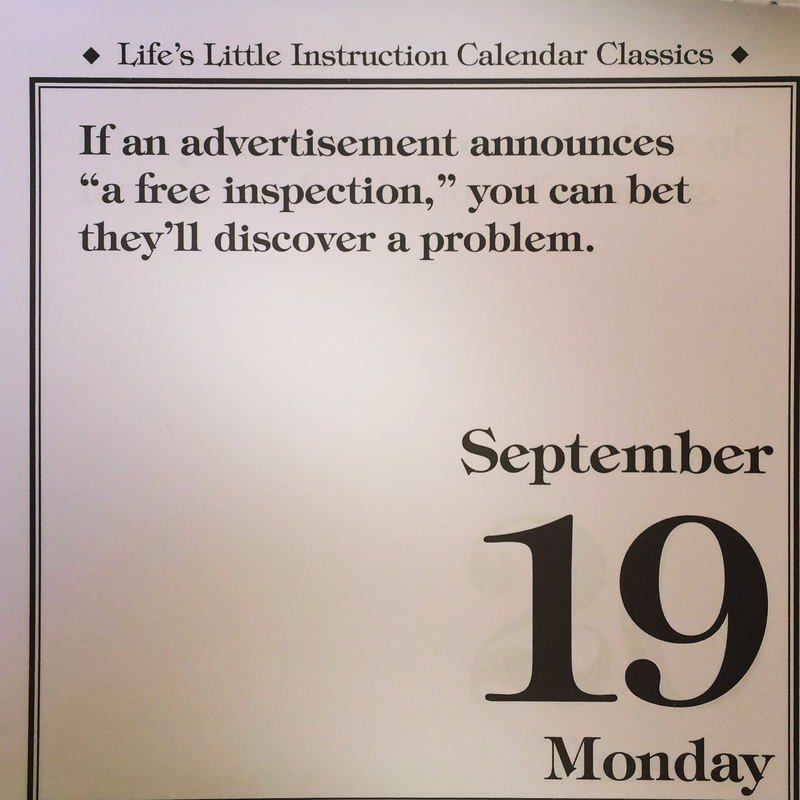 I know there are some professionals out there who won’t find a problem with someone’s car during a free inspection. But for the most part, I am hesitant about participating in these types of promotions. Although you can reason that there is nothing to lose by going through with the free inspection, the problems presented always weigh on my mind, even if I know they aren’t legitimate. Also, it isn’t always comfortable to decline the services of the business immediately after they gave you the free service (you can distinctly feel the pressure to go through with the recommendations). But, you live and you learn. Don’t Blink. For the past month or so, a certain consumer trend has found its way in newspapers and on news programs. For the first time ever, bottled water sales will surpass that of soda sales. At the center of this changing drinking behavior is safety. With significant news coverage on problems such as the lead contamination in Flint, people are opting for bottled water over tap water. You can say that Sidney and I are part of the bottled water trend. We buy our fair share of water from the store (as well as soda), however, our reasoning isn’t because of contamination. To be fair to Myrtle Beach, the water that comes out of our tap tastes just fine. 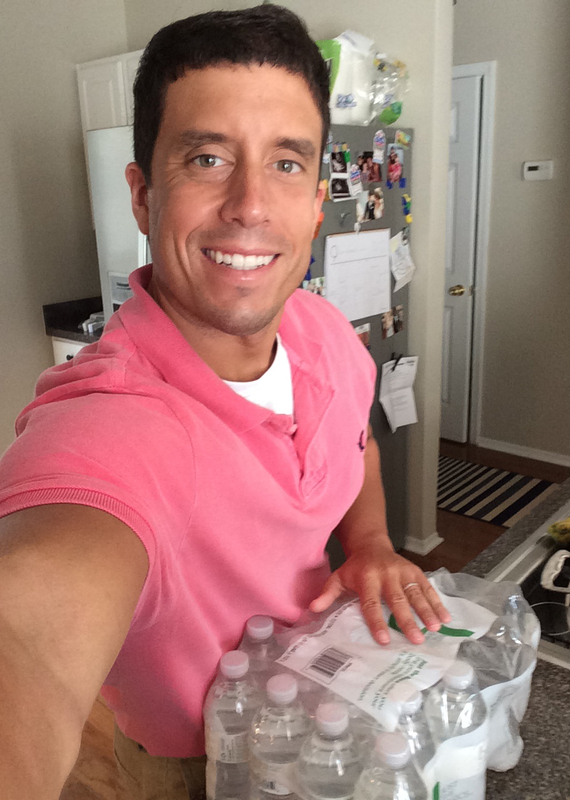 Rather, we consistently purchase bottled water simply for the convenience. Sidney and I drink a lot of bottled water. I remember 20 years ago when bottled water was just starting to catch on. There were a few major distributors selling it and for the most part it was not in bulk. You could buy a Dasani from a vending machine or purchase an Arrowhead bottle of water off the supermarket shelf for $1. Since then, in the past couple of decades, the bottled water industry has exploded. Bottled water is now sold in bulk and the the price is dirt cheap. I can walk inside any store ranging from CVS to Walmart to Target and buy a 24-pack of bottled water for $2.99. For those doing the math, that is less than 13 cents per bottle. The downside of course is carrying the bulky 24-pack to your car and then inside your house but I think the value is worth it. At $2.99 for a 24-pack, bottled water is cheaper than ever. But wait one second, Brent. What value are you talking about? Water from the tap is free. Why do you mean when you say “value”? Yes, I understand your point. However, as I said above, it is all about convenience. To me, convenience = value. When we bring our pack of bottled water home, we rip it open and make neat rows out of the bottles in our refrigerator. From that moment on, we pluck the bottles out of the refrigerator like it is the last water source in the world. When we go to bed at night, we each take a bottled water to the bedroom. When I get home from work, I grab a bottled water. When I am sitting around watching television, I help myself to a bottled water. By the end of the week, our bathroom trash can is filled to the brim with empty plastic bottles. There is no guilt drinking the water at this rate simply because it doesn’t hurt us in the checkbook. Likewise, when you don’t have bottled water, you have to grab a cup from the cupboard, fix some ice, and pour water from the faucet. When you have bottled water in the fridge, you don’t have to go through that process. I know I sound like the laziest person in the world but it is true. The abundance and cheapness of bottled water in stores everywhere has caused us to buy more of it and actually drink more of it as well. One thing we are guilty of in the Reser Household is not paying as much attention to the environment as we should. 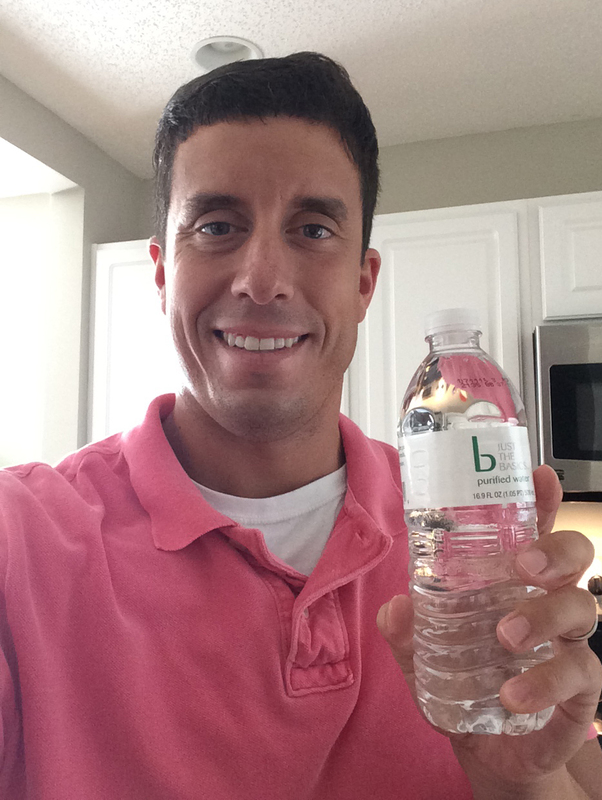 Yes, I have heard that when it comes to our planet it is not the best practice to consume bottled water. To those who don’t agree with our bottled water habits, I apologize. However, rest assured that at least today I won’t purchase another pack of bottled water. Why? Well, I bought one on Thursday and we still have a couple more days to go until we need a refill. Whether you consider bottled water a scam, a risk to the environment, or a lifesaver, this much is very true: it is a major industry that is doing very well. Don’t Blink. The Countdown – Did you know there is a Twitter account called Christmas Countdown (@ChristmasCount)? I discovered it yesterday and the account gives you a lot more than you bargained for. 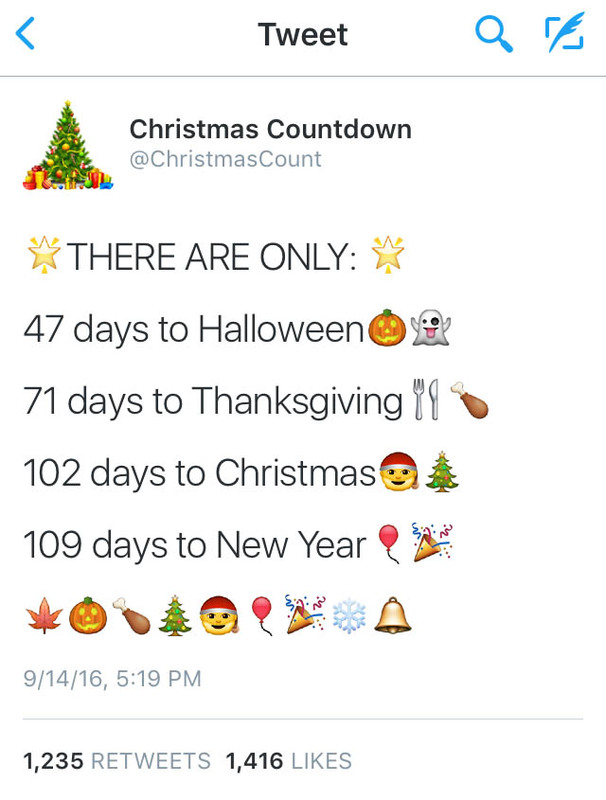 Besides the countdown to December 25 you also receive information on how many days remain until other holidays such as Halloween and Thanksgiving. And, as an added bonus, you are also treated to emoticons galore. For those who love the holidays, I wanted to put you in a good mood right from the start of my Thursday Rundown. This Twitter account and the way this Tweet is formatted just made my day. Great News for Geofilter Fans – Sorry for the back-to-back social media items but I wanted to alert all the Snapchat users out there about something. When I talked to people about the On-Demand Geofilters that became available for everyone to produce several months ago, I heard one consistent complaint: What about us non-designers? You see, to create a geofilter you needed to design it in Photoshop or other similar program. Not anymore! When you go to the geofilter website, you can now choose an already-made template and just fill in the blanks! 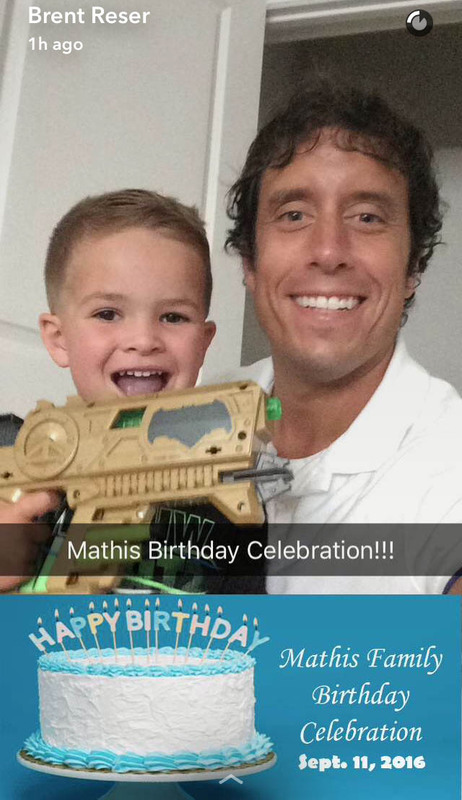 I discovered this when I visited the site last week to upload a geofilter I made for our monthly birthday celebration gathering. Although I plan to continue to just make my own, I might use a template in the future if I needed to activate a geofilter at the last minute and didn’t have time to create one. When I went to upload this geofilter, I saw that Snapchat now offers geofilter templates that anyone can use. By the way, I am with my nephew Harrison in this photo. The Final Three of “Big Brother” – Here I go again with possibly alienating a lot of my readers but I wanted to drop a quick note on Big Brother 18. Last night the final three was established. For someone like Sidney and I who have watched the entire summer, it is kind of a big deal. With James, Nicole, and Paul the last people standing, I 100% want Paul to win. For most of the season I didn’t even like him but I just think he has played the best game in the house and deserves the prize. Also, to be honest, and don’t tell anyone I told you this, but Paul has also rubbed off on me just a little bit. Comic Relief – As I mentioned in a previous blog post, I now make it a point to read the comics each day. Despite reading 20 or so on a daily basis, I never really find any worth sharing. However, this one I saw today kind of speaks to my dry sense of humor. Yes, after reading thousands of comic strips over the last several months, this selection from the strip Shoe is the one I decide to share. My dry sense of humor goes well with this strip. 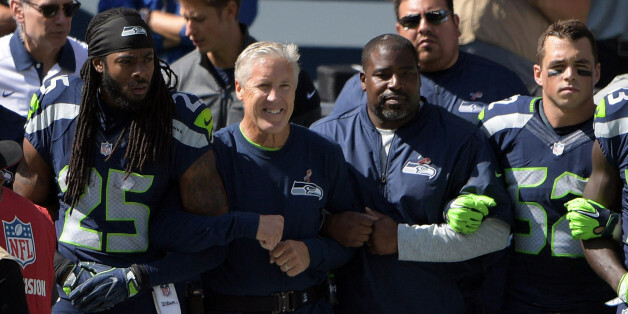 Seahawks Follow Up – Because I wrote about it this past weekend, I just wanted to quickly congratulate the Seattle Seahawks for standing with unity on Sunday. I thought it was a beautiful and powerful team act. Thank you to all the players and coaches for participating. So there you have it, another Thursday Rundown in the books. I wish you the happiest of weekends and I thank you for your readership. Remember, only 101 days until Christmas. Don’t Blink.